There were 476 press releases posted in the last 24 hours and 153,498 in the last 365 days. PHOENIX, ARIZONA, UNITED STATES, October 4, 2018 /EINPresswire.com/ -- Phoenix, Arizona – (October 3, 2018) – Care for people in mental health crisis does not adequately address the needs of the community it is intended to serve according to a major international report published today. 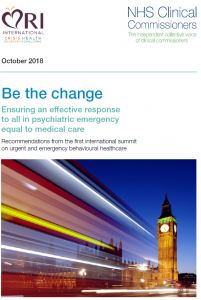 The report, “Be the change: Ensuring an effective response to all in psychiatric emergency equal to medical care,” published by NHS Clinical Commissioners, the independent membership organization for clinical commissioners in England, and RI International, a US-based healthcare organization, outlines ten recommendations that would make urgent and emergency psychiatric health care ‘minimally adequate’ and calls on governmental agencies, policy makers and health and social services to take radical action to address inequalities and improve mental health crisis care. The recommendations were solidified by delegates at an international summit in May 2018 that brought together commissioners, providers and clinicians from both the UK and USA; including primary care physicians, psychiatrists, individuals with lived experience, government employees and first responders such as ambulance workers and police officers. The summit found that despite cultural, system and geographic differences, the challenges faced in both countries were remarkably similar. The ten recommendations, aimed at government, policymakers and those implementing health and social services, include ending the current fragmentation of care through an integrated, systematic approach to mental health crisis care at the national level and a single national three-digit crisis hub number that drives easy access to care for anyone who calls seeking support. Read the full report at http://CrisisNow.com. A second IIMHL international summit on urgent and emergency mental health care is planned for September 9 – 10, 2019 in Washington, DC in partnership with the National Association of State Mental Health Program Directors (NASMHPD). About the report: The report presents the recommendations from a two-day summit of 50 sector thought leaders from the UK and USA, which took place in London in May 2018. The summit was a Match Event for the International Initiative Mental Health Leaders’ (IIMHL) event in Stockholm. Attendees of the summit included clinical and non-clinical experts, with experience that included government and law enforcement, and people with lived experience either as a recipient of care or as a family member, from the UK and USA. A full list of delegates is included in the report.